A BELOVED dog has bitten off far more than he can chew after he swallowed a 6cm-long fishing hook at Sharon. Captain the bull arab was rushed to the North Bundaberg Vet Surgery last Monday after a visit to the Burnett River went horribly wrong. 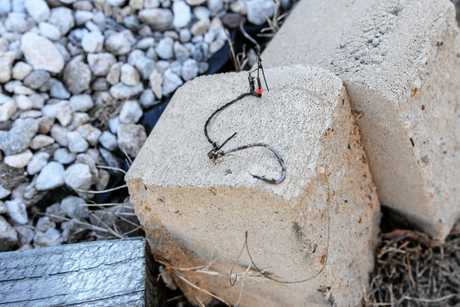 Owner Christina Rasmussen said her furry friend had been swimming, playing and exercising near the Sharon Boat Ramp when he picked up a fish hook, a large length of line, a lure and swivels. "He was vomiting straight away," Ms Rasmussen said. As soon as they arrived at the vet, a very distressed Captain was sedated. "We were hoping to remove the hook with a laparoscope, but he ended up needing major surgery," Ms Rasmussen said. After X-rays located the sharp hook in Captain's stomach it was confirmed he needed a specialist to cut him open. Ms Rasmussen drove him to the Sunshine Coast for his operation the next morning. "The hook was only a couple metres from the bin. Whoever left it there could've put it straight in the bin," she said. "It was a really large hook ... Not suitable for a fresh water fish at all, and it's not really a fishing spot there either." Captain walked away from what can only be assumed was a terrifying ordeal with three layers of stitches(two internal and one external layer). "He's in a lot of pain ... He can't do any exercise or anything for three weeks now and he's on a special diet," Ms Rasmussen said. And not that she needs it, Captain's 20cm-long wound and the resulting $6000 vet bill serve as constant reminders of the scary ordeal. But even still, Ms Rasmussen said it was never a question of whether the operation and follow-up treatment would be financed. 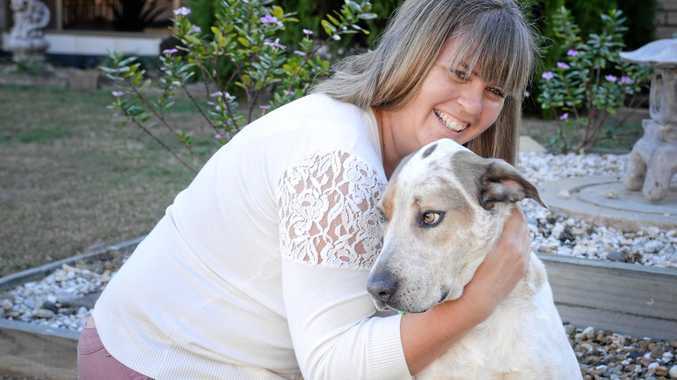 "He's been my partner's constant companion, so there was no other option," she said. Ms Rasmussen told the NewsMail Captain had seen her partner Glenn Carson "through some rough times". "That's what they're good for," she said. And so in return, it was only natural the couple be there for Captain the same way he had been there for them. "We were going to do everything in our power to pay the bill," Ms Rasmussen said. The couple said they wanted to use the accident to raise awareness with fishermen to be careful with their waste. "Just use the bin! It's a ski area, kids play there, anyone could step on it or pick it up," Ms Rasmussen said. "Wildlife would die a really painful death if they swallowed it." News TODAY we stop to remember the sacrifices of those who have served our country and fought for our freedom.